The most important Bronze Age kingdom in western Anatolia during the latter part of the thirteenth century BC was that of Ahhiyawa. Unfortunately, little is known of it, even down to its exact location and the origin of its people. While scholarly opinion is hotly divided, there may be a connection with the Mycenaeans, who certainly established commercial outposts on the Anatolian coast. The possibility is that they also established a political and military presence there, as a loose confederation of Mycenaean-period cities from the Greek mainland, Rhodes, and Thrace. The similarity between the names Ahhiyawa and Achaeans, the Homeric term for the Greeks of this period, has suggested this link since the kingdom's existence was first discovered. Occam's Razor also suggests that the simplest explanation be used, this being that if there are two similar names such as Ahhiyawa and Achaea then they are most likely variants of the same thing. Greek does not have a 'w' - they omitted it when writing so that Ahhiya and Achaea are even more alike. 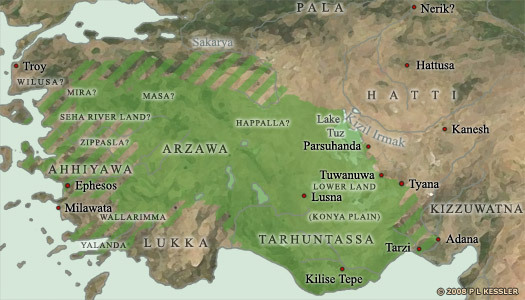 Mycenaeans or not, Ahhiyawa was situated between the western Anatolian coast and the Luwian state of Arzawa, with the Lukka on its south-eastern border. It first became prominent in the fifteenth century BC, but it was in the mid-thirteenth century that it became a serious problem for the Hittites, once Arzawa had become a Hittite vassal. Chronicled by them as the state of Ekmesh or Ekwesh (a name also linked to the Sea Peoples), Ahhiyawa clearly became one of the major powers of that period, and was also one with a strong seaborne trade which provided certain important trade goods to Syrian cities and through them, the Assyrians. The name 'Ekwesh' is very similar to the Indo-European word for horse. The related Latin word 'equa' is pronounced 'ekwa'. In this period Indo-Europeans were starting to lose their exclusivity when it came to using horses, but they still dominated the world's total number of horse users, which means that the Ekwesh were a division of Indo-Europeans. If the Ekwesh and Ahhiyawans were one and the same then they were both Achaeans and therefore also chariot-users. Towards the end of that same century - the thirteenth - the international system started to break down. At the same time it was hit by drought and a loss of crops. Food supplies dwindled and the number of raids by disenfranchised groups who had banded together greatly increased until, by about 1200 BC, this flood turned into a tidal wave which destroyed the Hittites and many Anatolia and Syrian cities and states. The term 'sea peoples' was used to collectively refer to this mass of raiding peoples. Judging by various contemporary accounts regarding them, it seems that the origin of many of them (if not all) was either in western Anatolia (from places probably including Ahhiyawa, and the Lukka, and perhaps Karkissa too), or mainland Greece (Mycenaeans escaping the Dorian invasion), or the islands in between. It seems likely that the Ahhiyawa kingdom similarly collapsed and its people went hunting for new territory. Ahhiyawa first becomes prominent on the Aegean coast of Anatolia, being mentioned in Hittite texts, but it remains of minor importance. Its main base or capital is Milawata (Millawanda, classical Miletus). Madduwattas of Zippasla marries the daughter of Kupanta-Kurunta of Arzawa and then wins the Arzawan throne itself (the circumstances are unclear). Then he moves his capital into Arzawa proper and enlarges this state in its western Anatolian holdings. When the Hittite king, Tudhaliya II (I), orders Madduwattas to put down a revolt in Happalla, he does so, but then forces Happalla to switch its loyalty to him. Then he bullies Pitassa into his kingdom, which brings Arzawa's borders even closer to the Hittite heartland. Under Tudhaliya's hapless successor, Arnuwandas I, Madduwattas even allies himself to his old foe, Attarsiyya of Ahhiyawa, and invades Alashiya. Madduwattas now holds the whole of western Anatolia (presumably excepting Ahhiyawa). The only monarch to have his name recorded. Attarsiyya conquers Alashiya for himself, re-igniting the enmity between him and Madduwattas. The latter flees back to Arzawa, leaving the island of Cyprus briefly in Ahhiyawan hands. The Hittites under Arnuwanda soon take Alashiya for themselves however, but for how long they hold it is unknown. Ahhiyawa shares peaceful relations with the Hittites at this point in time, bringing a statue of their main god to Mursili II to cure his illness. Ahhiyawa is attacked by the Hittites as they invade and conquer Arzawa, bringing their power and presence right up to Ahhiyawa's borders. Perhaps as part of a 'cold war', Ahhiyawa later supports an overthrow of the ruler of Wilusa by one Piyama-Radu (see circa 1245 BC). An elusive 'king of Ahhiyawa', is a major player, and is addressed as 'brother' by the Hittite king, Hattusili III, This makes him a recognised equal, but he is hard to pinpoint in any detail. The peaceful relations of the previous century are now harder to find as the two kingdoms vie for supremacy. Hattusili mentions that Wilusa has previously been a bone of contention between the two kingdoms. Brother. Gave aid to Piyama-Radu. Tudhaliya V (IV) of the Hittites complains that Ahhiyawa is behind rumblings of trouble from Tarhuna-Radu in the Seha River Land in Arzawa. The Hittites have repeatedly asked Ahhiyawa's king for cooperation in maintaining stability in western Anatolia but, whatever the unrecorded response, the pleas seem not to lead to any reduced insurrectionist activity in the western Hittite states: '...Thereafter, Tarhuna-Radu waged war [against the Hittites] and relied on the king of Ahhiyawa [for support]. And he took refuge on Eagle Peak (ie. Mount Harana)'. Hittite vassals in the west and south-west of Anatolia rebel under Piyama-Radu, perhaps inspired by the king of Ahhiyawa. Piyama-Radu's name suggests he may be an Arzawan and he already seems to have been expelled from Wilusa after taking control there. King Tudhaliya is unable to suppress him, despite invading and taking Milawata and perhaps the nearby dependant city of Atriya. Amurru concludes a treaty with the Hittite king, preventing seaborne trade between Assyria and Ahhiyawa. The treaty lists the great kings of the period with whom the Hittite king considers himself to be equal: Egypt, Babylonia, Assyria, and lastly Ahhiyawa. After writing the treaty, the scribe crosses out the final name. Clearly Ahhiyawa is a borderline case. With the decline of the Hittites, the textual information regarding the Ahhiyawans also disappears. It seems unlikely they are definitively defeated as this is bound to be recorded - instead, they are probably assimilated into the newly emergent kingdoms of the twelfth century, some of which have a Greek heritage which the Ahhiyawans may share. 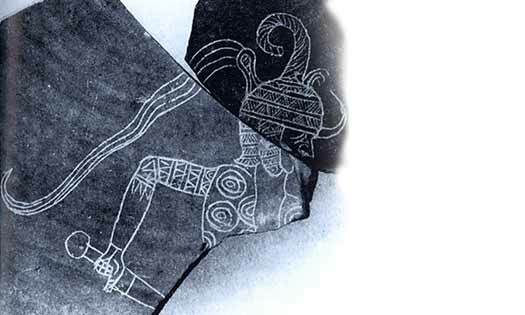 It is theoretically possible that they become involved in the Mycenaean fight against Troy. When the latter is defeated, further areas of the Anatolian coastline are opened up to Greek settlement, and pressures caused by the regional drought and instability of this period force the dissipation of Ahhiyawa as its people find safer settlement in the north. Another possibility is that some of the Ahhiyawan population can be equated with the Ekwesh, part of the Sea Peoples according to Egyptian accounts. If so, their hostility towards the Hittites probably leads to their being involved in the destruction of that state when it falls in about 1200 BC. Doubt about a Mycenaean link (and therefore an Ahhiyawan one if they are similarly Greek in origin) comes from Ekwesh prisoners taken by Egypt. 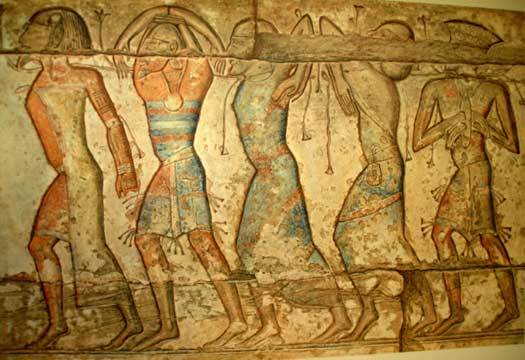 To be sure of the numbers of enemy dead (6,000, with 9,000 prisoners), the pharaoh orders that the penises of all the uncircumcised victims be cut off, along with the hands of those who had been circumcised. The Ekwesh number amongst the latter, making a Greek connection doubtful.